Soave is a famously large, white wine DOC in the Veneto and	is located to the north and east of the city of Verona. It gets its name	from the Suevians, a German tribe who arrived in Italy along with the Lombards	during the Dark Ages. Its Garganega-based wines leapt to prominence in 1968 with the creation of the Soave DOC, spurred on by a massive co-operative industry. Soave Classico covers the original hillside	zones around the communes of Soave and Monteforte, while a new hillside catch-all sub-zone, Colli Scaligeri, has also been created for those just outside the Classico area. With the award of DOCG status to Soave Superiore in 2006, the authorities are making a concerted effort to raise the quality and profile of all Soave wines.Trebbiano Toscana, which formerly made up 15% of the blend, is now out, and the minimum alcohol level has been raised by 0.5%. The minimum dry extract has been raised to 18 grams/litre, vine density has been capped at 3,300 vines/ha and the vines themselves may only be trained using the espalier, single pergola or single Veronese pergola methods. Soave is now made with 70% Garganega with the remaining 30% coming from	Trebbiano di Soave, Chardonnay or Pinot Bianco. Soave Superiore must be at least 12% alcohol and cannot be released onto the market until 1st September the year after the harvest. In addition, the minimum level of dry extract has been raised to 20 grams/litre and yields have been reduced to 70 hl/ha. 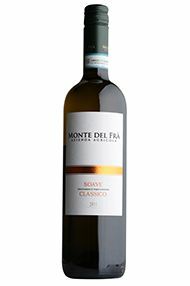 At its best, Soave should exhibit a lemony fruit character, good structure and a creamy, minerally, citrus finish.